Including Sedna, 12 trans-Neptunian objects have aphelion distances beyond 800 AU. (Another 5 unusual asteroids have aphelia over 800 AU; these may be inactive comets.) 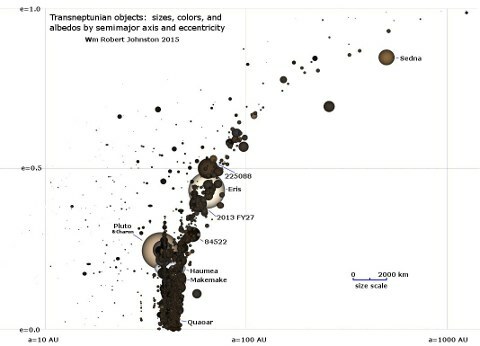 A total of 66 TNOs (plus 13 more unusual objects) have aphelion distances exceeding 200 AU. Relatively few (10) have been discovered with perihelion distances greater than 47 AU, and only 6 with perihelion distances greater than 50 AU. Data thus far suggests than there is indeed a cutoff to the classical TNO population around 47 AU, although the discoveries of Sedna and 2012 VP113 suggest an unrecognized population of much more distant objects (see below). Of the 2,946 outer solar system objects counted above, 92 (3.1%) have inclinations from 40° to 90°, and 91 (3.1%) have retrograde orbits. Most if not all of the latter objects may actually be comets no longer showing cometary activity. 2015 RR245 (2:9 resonance object), 810 km? 2014 EZ51 (scattered disk object), 810 km? 2010 RF43 (scattered disk object), 810 km? (120178) 2003 OP32 (Haumea family), 740 km? 2015 KH162 (scattered disk object), 740 km? 2014 WK509 (scattered disk object), 700 km? 2010 JO179 (scattered disk object), 700 km? V774104 (Inner Oort cloud object? ), 700 km? With 86 binary/multiple TNOs (or SDOs/centaurs) (through April 2018) in a population of 2,707 objects, it appears that binary TNOs are quite common. Binary TNOs identified in 2005 include several close binaries, suggesting more binaries that cannot yet be resolved. Last modified 22 April 2018.